I am sitting here trying to think of how to start this post. Staring at my hands poised above the keyboard I see various shades of paint, the bit of subfloor still lodged under my fingernail, and the cuts and bruises from banging into things like walls and pry bars. These are not the hands of a pampered writer/historian. These are the hands of a labourer. 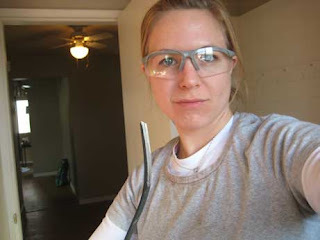 After months of watching those home reno shows on HGTV I’ve decided they’ve been holding way back on me. Through the magic of tv no one ever gets their clothes dirty or swears their head off when frustrated (I guess I sound like a contractor too!). I believe they are in a conspiracy with Home Depot, Rona, Home Hardware and all those other stores out there to help the DIY-er with ‘easy and fast’ projects. At the very least, it’s good to have a whole new “hard” skill set to supplement my “soft” writing ones. And the callouses to prove it. I'm pretty sure you've always "sounded like a contractor".